Railways offers subsidised pilgrimage packages. सच में @sureshpprabhu sir आपने जैसा कहा वैसा कर रहे हैं We r on track sir, हम दुनिया को दिखाएंगे, भारत क्या है..
30% growth witnessed in the number of passengers at Akaltara Railway Station during fortress check. The biggest e-commerce entity in India by far, ever since its inception. Now, Suresh Prabhu, the Railway Minister of India, is one politician who looks ‘intensely’ busy on Twitter – as his Twitter feed for this day (or any other day) suggests. 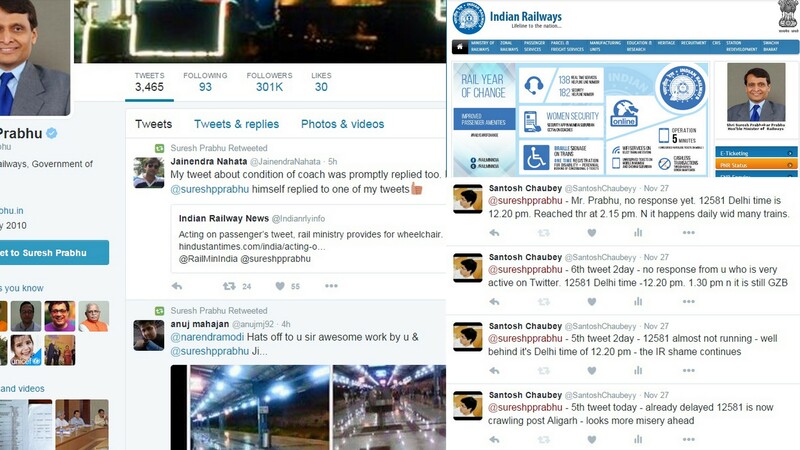 And these are just some of a barrage of Tweets on his Twitter page – tweeted (and retweeted) by Mr. Suresh Prabhu on November 27. And he does so daily. And the issues that he looks concerned about sound holistic – clean trains and platforms, other cleanliness measures in different railway services, reforms in Indian Railways, the efforts for a ‘turnaround’ story, capacity enhancements, improvement in operational statistics, energy conservation, social obligations like ‘rain water harvesting’ and so on – and the concern of passengers’ well-being – but there is a catch. @sureshpprabhu – Mr. Prabhu, no response yet. 12581 Delhi time is 12.20 pm. Reached thr at 2.15 pm. N it happens daily wid many trains. @sureshpprabhu People say n you also retweet -but y some trains get delayed daily-like this 12581-a daily routine-today, it’s already 3 hrs! @sureshpprabhu People say, you also retweet – but y some trains get delayed daily-like this 12581-a daily routine-today, it’s already 3 hrs! These eight tweets were my experimental call to check the ‘social sensitivity of social media alertness’ of our Railway Minister – who by any possible means – looks very Twitter savvy – in using social media as an effective tool of his governance. But as expected, he did not respond to even a single one – because they were pointing to a well known, universal shame of Indian Railways that all Indian Railways (IR) officials conveniently and habitually deny/ignore/pass – that almost of the trains in India don’t run on time – that travelling by many trains are considered an absolute wastage of time as they run delayed by hours – day after day – just name them and one can count many of them – in every part of the country the Indian Railways is operating in – and that includes almost the whole of the country. There are trains that are cursed to get delayed regularly – the ‘ignorable gems’ in eyes of IR’s apathetic officers. Here, in my case, I started my train journey at 10:30 PM on November 26 night. Though it is a superfast train (Number – 12581), people warned me of its bad reputation of running late almost daily. But I thought to give it a try, as I wanted to reignite the romance of a train journey after a long time and prompted by ‘prompt tweets’ of Suresh Prabhu, I thought I should take a chance. But came November 27 morning, and my hopes had some serious beating. When I woke up, I found the train was behind its schedule while at Kanpur and was running late by some 2.30 hours. Well, I had an important meeting scheduled in the evening and I started feeling sort of unease. But then, I also knew I could not do anything. Various precedents of my yore have told me that one should never trust the trains run by Indian Railways, especially in crisis hours. 99 per cent chances they will fail you. After all, you can gauge sentiments on this line by the fact that a train running one or two hours late is considered ‘on time’ by the standards of Indian Railways. While my unease was growing, I thought to use it to ‘gauge’ the sensitivity of Mr. Railway Minister. Starting from around 7 AM, I tweeted tagging Mr. Prabhu around 8 times, expecting some response from him. But it did not have to come and it didn’t come. Either Mr. Prabhu didn’t see any of my tweets, something that is hard to believe going by the kinds he retweets daily, or he conveniently ignored them. And that clears one thing – the fact that is known widely – that our politicians don’t see or don’t like to see the ‘uncomfortable facts’. There is nothing wrong in what Mr. Prabhu does with his Twitter page. Even if selectively, he is active there. No one can expect he can do some miracle or can turnaround the massive public organization with massive losses run by the Indian government in such a short time with most of its senior Railway officials turning a blind eye to what should be treated as criminal offences in a civilized society. We know a ‘totally’ politicised Indian Railways cannot accommodate its vast network of trains to manage ‘running efficiency and timeliness’ with the poor infrastructure it has right now but just to give indications of a positive symbolism, Mr. Prabhu could have responded to my tweets (and should respond even to negative or critical tweets). What do you say Mr. Prabhu (@sureshpprabhu)? This entry was posted in INDIA, INDIAN POLITICS, LIFE EXPERIENCES, SOCIETY, TRAIN JOURNEY and tagged #SureshPrabhu, #WPLongform, @RailMinIndia, @sureshpprabhu, Colores Infinitum, Indian Railways, Indian trains, Rail Journey Experience, Railway Minister, Railways Mess, Suresh Prabhu, Train Journey, Trains Running Late. Bookmark the permalink.